Khichri has been a mundane kind of a meal for me , a meal cooked in a hurry or a student's sunday lunch when the mess is off , or a bachelor's way of life , food for the sick, a poor man's concoction .... it has always been a dish which we were embarrassed to acknowledge ..........it sounded so boring when everybody used to rave about maggi and it was khichri that i preferred............i used to love it secretly. You know a well spread full course meal is not only a meal for most of us , it is more like a statement of our well being , financially........i am talking about the great Indian middle class which some believe has vanished under the heights of super specialty malls n multiplexes......for me , it is very much there , it is just that the middle class can afford a lot more now.....the mind set hasn't change.......khichri was a poor man's food n not fit to be in your favorite food list. But i am clever.....don't you know ? 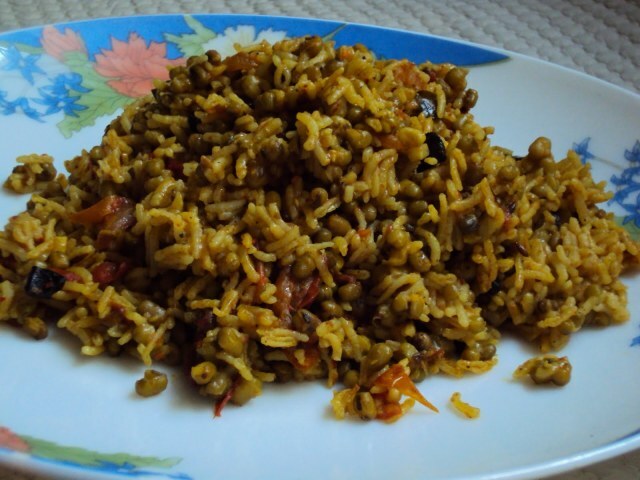 He loves tahiri and i make khichri n tell him it is tahiri..........and he loves it.......do you have a kid? This is a tomato masala bhuni khichri or a daal wali tahiri .whatever you like to call it ..........as per your convenience. With a sealed pack of plain curds and any kind of raw salad it is a very good balanced meal and a very good option for lunch box.........i have been getting requests for lunch box suggestions n i hope i am able to post a few more. Soak the mung beans overnight or for 3-4 hours at least , it will become almost double in volume. Wash the rice and drain , keep aside. Heat ghee in a wide thick base pan with tight fitting lid ........throw in the asafoetida and cumin seeds n black peppercorns .let them sputter. Add the ginger garlic paste, green chillies and the curry patta and stir for a minute , throw in the powder masala mix , fry for a while till the masala gets aromatic , preventing burning . Add the chopped tomatoes and salt and cook till the tomatoes are mushy . Add the soaked rice n daal and bhuno , that is , stir fry the mixture for a couple of minutes till you see a slight change in the color of dal n rice......a bit translucent . Pour 3.5 cups of water and let it come to a soft boil , adjust the flame to the minimum , cover the lid and cook for about 10 minutes........check after 5 minutes to adjust cooking time.....the grains of rice should be firm and the daal should get mushed when pressed , but should retain their shape. It's usually a one pot lunch for the two of us , it is a good choice for a filling n non messy lunch box too....dahi ( plain curds) is a must with it and some sliced cucumber , onions and carrots make a perfect accompaniment. The UP version of bhuni khichri is spicier and laden with ghee , it has bay leaf instead of curry patta and a few cubed potatoes are sometimes thrown in........it is actually a very forgiving dish , very very customizable .........according to your mood , convenience and off course your imagination......not to mention your pocket.......add bacon , anchovies, prawns, boiled eggs or even nuts and be merry with khichri........or kedgeree. This is such a good option for lunch box. Looks very delicious. This is a new recipe for me, I love regular kichri, I'm sure I'll like this too..
really u r giving new recipe idea..this looks so delicious and healthy . the only khichri i've ever had or made is mung dal waali khichdi... my husband loves it. This looks different and spicy. I also like the addition of whole mung dal. But I make tehri very often its a fantastic one dish meal with potful of vegetables, and my daughter has no problem eating it. so i guess next time I'll try it your way! Haaa....loved ur post...wat all u hv to do for ur families health. Me too secretly sum up with all the poor hated vegetables in my household...to only come up with sumthing new..n I call it my invention...smilin. Tis recipe is new to me, though i do cook similar Khichri, introduced to me by my ma-in-law...n many more versions. Tis humble dish travelled all around de world purfecting itself as per the countries tastebuds....simply love food history. Hi sangeeta - must say I always thought it was us who stole the dish from you! Pamella ...now comes the opinion from Scotland. You are the person who can throw more light on kedgeree tradition. I loved this twist to my ever favorite khichri.... Awesome eye catching & tempting captures of that scrumptious prep...... I even called in Kuku to have a look at it..... He was very pleased too.... Kudos & thanks for sharing this unique prep..... God Bless!!!! I like to hv khichdi once in a while...such a comforting dish...quick,easy,one pot meal...even at my in-laws house they dont like simple khichdi but the bhuni khichdi...ur version luks amazing. Looks lovely and spicy and so wonderful. Very nice recipe. I was out to Himalayas , so cd not read it. I will try this one. In Bong recipe , we use green peas in Bhuni khichuDi...but this is very different and I like it. khichari looks so yummy and tempting.. very nice to read about the history too. Nice khichari looks really yummy. thanks amrita...yes i make that fried rice with mung sprouts too , usually when i don't want to cook n have some sprouts n leftover rice in the fridge....actually sprouts are so versatile n completely worth to take the pain to keep them ready in the fridge. We love khichdi, with dahi and papad..I too make this one and many times I add whole masoor instead of mung...lovely pics too!! Hi Sangeeta, Thanks for this khichree with a twist. This is going to go to our lunch boxes tomorrow morning? Sangeeta, can you post some recipes appropriate for lunch boxes? My husband and I go to work and every morning I have hard time deciding on what to put for lunch. My husband doesn't like rotis or parathas for lunch so I have hardly any choice left. Heyyyyyyyy, could you also share the different temperings that you mentioned about for the plain khichdi? I luv my plain khichdi, but am sure these temperings will give khichdi some extra zing and would be a good variation :).